The Hydrodynamics laboratory of Boulogne-sur-Mer is part of the Development and Research Technologies unit and carries out researches on submarine devices and new offshore concepts. Experimental and numerical facilities are used to give hydrodynamical studies and expertises in partnership or confidential matter. 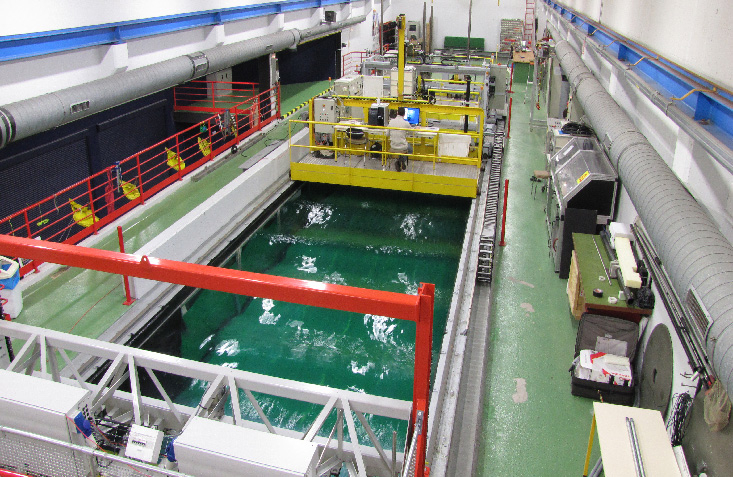 For that purpose, the Boulogne-sur-Mer unit is in charge of a wave and current flume tank where fluid/structure interactions problems are tested under conditions closed to real ones. Specific measuring techniques dealing with hydrodynamics are regularly involved and implemented. Tests are carried out for french and foreign partners for development and research projects or for assistance in confidential matter. For any information or request for tests, we invite you to fill in the application form on Contact page.